For all of Adelaide's aspiring to be "A slice of London in the Antipodes", the colony attracted a large Lutheran population by virtue of Adelaide's religious liberty and status as a Paradise of Dissent. Frederick William III was determined to united the Protestant churches of Prussia in the 1830s & 1840s. The Old Lutherans refused to this change in church edicts so searched for new homes abroad. George Fife Angas, the London financier who founded the South Australia Company to promote and invest in this brave prototype colonial model. As a Baptist he believed in worship free of intermediaries ie Bishops and Popes. Fife was keen to render assistance to their plea. The legacy of that history were the Villages of Klemzig on the River Torrens, Bethany an Lobethal in the Barossa Ranges. Louis Henn & Co were Lithographers in Currie Street in the Adelaide. Henn had arrived in 1878 and set about recording this model town 40 years after Proclamation. In 1849 a Mr. Brewer and Mr Robertson ‘beg[ged] most respectfully to inform the inhabitants of Adelaide’ that they had opened their store, with linens and drapery from ‘all the principal manufacturing towns in the United Kingdom’. Their new store was called The Bee Hive. Carl Stratmann was born in Kreberg, Germany in 1868. He was a trained confectioner who had worked in Berlin, Copenhagen and London before migrating his talent to Mebourne in 1891 were he worked for MacRobertson's. Later he set up a confectionery business in Sydney in 1905, arriving in Adelaide in September 1913. He set up business next door to the The Bee Hive, at 34 King William Street. Rachel writes, Carl “was artistic with his confectionery business and is an artist who is fairly unknown but had worked in Europe before coming to Australia.” She also wrote “he was an individual character”. In 2003 the wonderful Elizabeth Tolley brought in a find from a secondhand goods shop in the Adelaide Hills. "You'll like this challenge Sandy!" It was an acidic yellowed etching of sorts in a thin black frame. On the back was taped a hand written assessment of the etcher by a then Norwood Gallery owner and valuer Rachel Biven of Sydenham Gallery written in 1990. Entitled “Old Settler’s Home at Kersbrook” Rachel writes, “Carl Stratmann was the first confectioner in Adelaide”. I had assumed Mr. Haigh was the bearer of that honour. This historical thread needed a tug! In May 2015 I had placed the restored etching online. A Sydney grandaughter of the Stratmann's made contact. She was thrilled to see an example of his artistry while in Adelaide. It seems that the money Haigh paid for the business, recipes, library, equipment and leasehold was placed in a Swiss bank account. With Anti-German feeling so high, boycotting of German place names, traditional food, even "Fritz" renamed to "Australian Sausage", Stratmann feared the money may be confiscated in lieu of his open internment protest. Apparently his family knew nothing of this until the Swiss bank investigation into WWII German forgotten accounts. 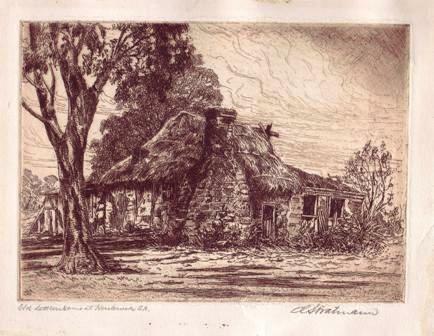 “Old settler’s Home at Kersbrook, SA” Original etching by Carl Stratmann, brought in for restoration. It is the large Lutheran population in Adelaide we can owe the discovery of this beautiful etching. It was sent at Christmas 1928 to Mr & Mrs Trudinger “Wishing you both a happy Christmas and a bright New Year. From Carl and Ellen Stratmann”. The successful paper restoration uncovered the local framer’s label of Dimond & Son, who had written the customer's details on the rear of the paper, a quaint habit of past framers. This discovery has given us a portal a portal back to a challenged society in during WWI Adelaide circa 1915. Torrens Island Interment Camp/Kaiser Cafe…German-Aussie humour? In 1914 Germany declares war in Europe but that is far away from Adelaide. Germans had been arriving by the boatload since 1837. However, times of war are understandably riddled with charged emotion, possibly hidden agendas. In 1915 it is reported that Stratmann flew a German flag from his CBD business. Torrens Island, in the Port River estuary, became a German internment camp (effectively prisoners of war) on the mosquito infested ex-quarantine location. Such action took fathers and husbands out of the workforce, unable to care for their families. Stratmann was no doubt protesting such government and social action, a sad, yet predictable backlash by the locals in support of our troops in Gallipoli and Europe. Gallipoli commenced on 25 April 1915 This was the first major battle where Australia and New Zealand forged a national conscience with massive loss of life. Stratmann may have been reasonably protesting but “soon tired of the taunts and harassment and sold his business ”. What was one German immigrant's protest was another's opportunity in the "Big Smoke". Alfred Ernest Haigh,(1877-1933) ventured up from Mount Gambier to test the capital city market for his selection of confectionery. He purchased Carl Stratmann’s business which he re-named Haigh’s Chocolate Depot. Apparently Haigh was a self taught but improved upon inheriting Statmann's impressive library of manuals and confectioners catalogues. 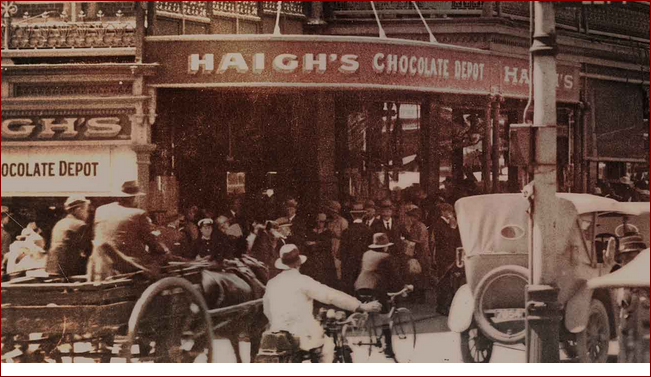 In 1917 Haigh started producing chocolate covered fruit. In the same year he moved the family to a cottage on Greenhill Rd, Parkside, and built a factory behind. Today’s chocolate is made at a Mile End factory, brought up to the Parkside HQ to be hand finished for eager public consumption. It was in 1922 Haigh moved from No 34, once occupied by Karl Stratmann, to the highly coveted corner location known as Beehive corner. This descision was considered a brave at the time, but the generations have never doubted it benefit. Lindt & Sprüngli, Master Chocolatiers since 1845. In 1946 his grandson, John Haigh, proactively wrote letters to all the internationally accredited master chocolatiers, a strategy encouraged by business mentors and coaches to this day. He received one reply from Swiss chocolate maker, Lindt & Sprüngli, with whom John trained . Returning via the United States, he sought out production processes, shop layouts and contemporary marketing ideas from packaging to promotional concepts. The Art Deco Capri Cinema Built 1941 in Goodwood. So was born the common sight of Haigh Tray Boys and Tray Girls often seen at cinemas in the 1950s and 60s dispensing Haigh's treats at the front of the screen during interval. To this day the Art Deco Capri Theatre on Goodwood Road maintains loyal ties with Haigh’s Chocolates. The rest is history, as they say. Haigh’s brand is a much loved South Australian Icon whereas Stratmann’s was almost lost but for this information that travelled, held by humble sticky tape, written by Rachel Biven in April 1990. FOOTNOTE: Rachel Biven was known to me as the author of a precious book, “Some Forgotten, Some Remembered : Women Artist’s of South Australia” (1976). Women artists were often nothing more than footnote to history, given their main values considered as wives and mothers. Also I fondly remember a wonderful botanical artist, Pam Brindsley, whose meticulous botanical art I had framed for two decades. On mentioning Rachel Biven, her face lit up as Sydenham Gallery was where her work had been exhibited many times. Yes, Adelaide is a small Australian City, but it has attracted many talented souls since 1836. » Colonial German Imigration, Gallipoli & Adelaide Confectionary ? » Birds of Paradise: "Birds of Perpetual Flight"? » Are Trade Guilds Relevant Today?